King of the kitchen? 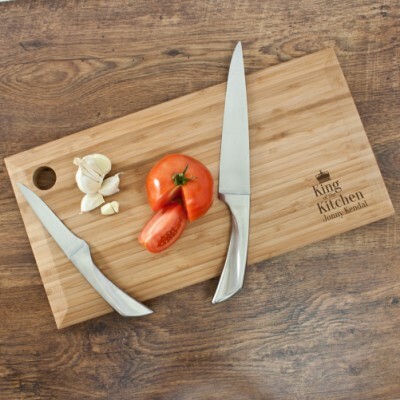 Crown him with his very own chopping board. Bamboo bevelled chopping boardmade from sturdy naturally antibacterial bamboo and can be used on both sides. Bamboo wood is a highly environmentally friendly as it is one of the fastest growing plants in the word. Our use of bamboo is environmentally friendly and ethically produced. Bamboo wood also helps to keep your knife blades sharp. Personalise this board with a name, the words 'King of the Kitchen' come as standard.